We offer fallow deer and axis deer hunting trips in at our ranch in Dayton TX, featuring executive hunting blinds and archery stands at each location. Fallow deer are known for a few things that make them attractive to hunters: Their distinctive look, with large palmate antlers; their caution that makes them more challenging to hunt; and the fact that Texas has no seasonal restrictions on hunting this type of deer. Hunting axis deer is similar to hunting fallow deer in some ways -- both are exotics, and the does of both species are spotted. Davis 5 Ranch is pleased to offer fallow deer hunting packages as well as axis deer hunts on our hunting ranch. 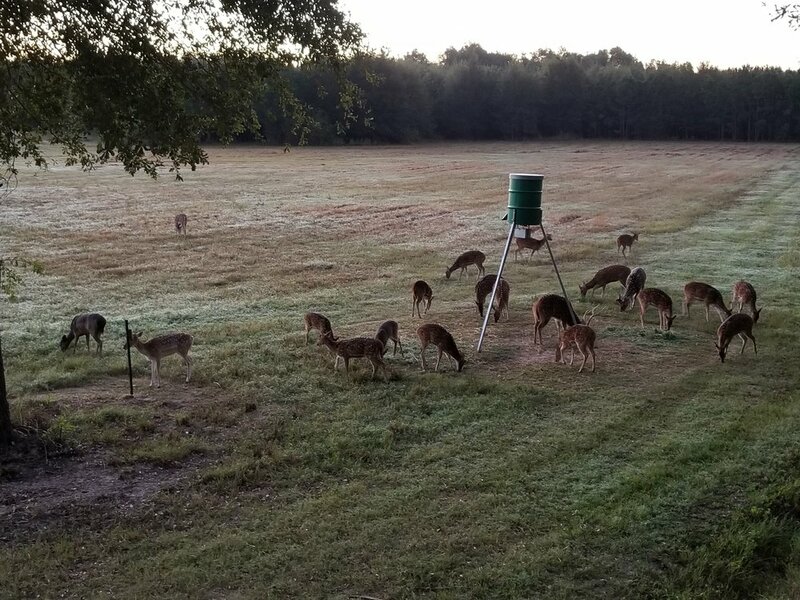 With nearly 2,000 acres of fenced-in hunting land and executive hunting blinds and archery stands at every location, Davis 5 Ranch offers all the amenities you need for an enjoyable and exciting axis or fallow deer hunting trip. Our fallow and axis deer hunts are one of our exotic hunt package offerings and are guided. More information about our axis-fallow deer hunting fees, as well as our other hunting packages and additional services our staff can help you with, is available on our Hunts page. When you join us for a fallow deer hunt or axis deer hunting adventure, lodging and meals are available at our spacious and comfortable six-bedroom hunting lodge for an additional fee. Located just north of Dayton, TX and within an hour’s drive of the Bush/IAH Airport, Davis 5 Ranch and your next axis or fallow hunting experience are easy to get to from just about anywhere. Contact us today to discuss dates and to book your next axis hunt or fallow deer hunt at our Dayton hunting ranch!